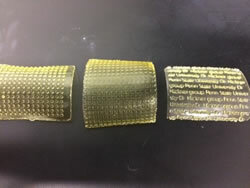 Penn State Materials Research Institute via Science Daily: A new type of 3D printing developed by researchers at Penn State will make it possible for the first time to rapidly prototype and test polymer membranes that are patterned for improved performance. Ion exchange membranes are used in many types of energy applications, such as fuel cells and certain batteries, as well as in water purification, desalination, removal of heavy metals and food processing. Most ion exchange membranes are thin, flat sheets similar to the plastic wrap in your kitchen drawer. However, recent work has shown that by creating 3D patterns on top of the 2D membrane surface, interesting hydrodynamic properties emerge that can improve ion transport or mitigate fouling, a serious problem in many membrane applications.